The Marlborough Region (Māori: Te Tauihu-o-te-waka, or Tauihu), commonly known simply as Marlborough, is one of the regions of New Zealand, located in the northeast of the South Island. Marlborough is a unitary authority, both a region and a district, and its council is located at Blenheim. It has a population of 46,600 (June 2018). 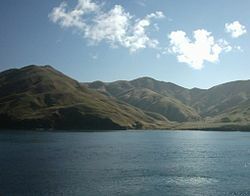 Marlborough is known for its dry climate, the picturesque Marlborough Sounds, and Sauvignon blanc wine. It takes its name from the earlier Marlborough Province, which was named after His Grace General The 1st Duke of Marlborough, an English general and statesman. Between these two areas is the long straight valley of the Wairau River. This broadens to wide plains at its eastern end, in the centre of which stands the town of Blenheim. This region has fertile soil and temperate weather, enabling it to become the centre of the New Zealand wine industry. The fourth geographic zone lies along its north coast. Here the drowned valleys of the Marlborough Sounds make for a convoluted and attractive coastline. The town of Picton is located at the southern end of one of the larger sounds, Queen Charlotte Sound. The town of Havelock is located at the southern end of the Pelorus Sound, the Pelorus Sound also feeds into the Kenepuru Sound. The sub-national GDP of the Marlborough region was estimated at US$1.193 billion in 2003, 1% of New Zealand's national GDP. View looking north from Blenheim of Marlborough vineyards. Marlborough is a well-known wine-producing region in New Zealand. Thanks to aggressive growth in the export market, the Marlborough wine region is now responsible for the production of 77% of New Zealand's wine. The most popular varietal is Sauvignon blanc, closely followed by Pinot noir and Chardonnay. Marlborough's first vines, a small block of Brown Muscat, were planted in 1873 by local David Herd. However, in 1931 his son pulled up the last of his vines and no others were planted in the region until the 1970s. Wine giant Montana Wines (now Brancott Estate) returned wine making to Marlborough with the purchase of 1173 hectares in 1973 (100 years after the first Muscat grapes were planted). The majority of Marlborough's extensive vineyard plantings are around Renwick, Blenheim, and Cloudy Bay in the Wairau valley. Further south in the Awatere valley are plantings near Seddon. These are for the most part on old terraces of the Wairau and Awatere rivers. The area is widely considered by many critics to produce some of the world's best Sauvignon blanc. One wine critic said that "no other region in the world can match Marlborough, the northeastern corner of New Zealand's South Island, which seems to be the best place in the world to grow Sauvignon blanc grapes." Wairau River, Tohu, Forrest Wines, Marisco Vineyards, Brancott Estate, Oyster Bay, Te Pa Wines, Hunters Wines, OTU Wines, Mud House, Cloudy Bay Vineyards, Framingham Wines, Saint Clair Estate Winery, Wither Hills and Grove Mill are notable vineyards in the region. Also important is the production of Methode Traditionelle sparkling wines, particularly near Renwick, from Riesling, Pinot noir and Chardonnay. ^ "Blenheim". New Zealand History. New Zealand Ministry for Culture and Heritage. Retrieved 11 October 2014. ^ "About Marlborough - Wine Marlborough". www.wine-marlborough.co.nz. ^ "Marlborough's Wine History - Wine Marlborough". www.wine-marlborough.co.nz. ^ George M. Taber, Judgment of Paris (New York, Scribner, 2005), p. 244. 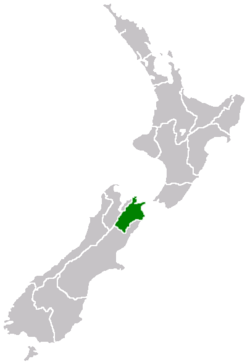 Wikimedia Commons has media related to Marlborough Region.